Four Point Major (known as Massive Major to many breeders) weighed in the 2600-2700# range. What set him apart was his ruggedness, size, thickness, and longevity. In some ways he was a bull ahead of his times. His daughters were especially good with excellent udders. GX Ridge Runner was sired by Columbus and owned by the Tacoma Cattle Company (Duane Sicht). He was a medium size (2300# plus) bull know for his gentle disposition. In fact he made an appearance on the Capitol Lawn in Jefferson City, Missouri in a promotion for Beef during May. He was used by many Shorthorn breeders during the early to mid-80’s with many winning offspring. He was sired by Spiro who was undoubtable the most muscled of all the Graham bulls in the early 70’s. His dam is Miss Springfield 2nd, who was a tremendous cow for the Grahams. She incorporated the best genetics of the time as a linebred cow. Her genetics include Scottshill Major Clark on both sides and the famous Thornwood Royal Dot cow who was also the dam of Abraham and Thornwood Major. In addition she is the grand dam of Albo. HHKA Buttercups Prince 20th was bred by Hub’s Shorthorns of Norton, Kansas. He is a linebred bull that through his sons, such has Hub’s Director and Hub’s Exceptional, he has had a significant impact on the Shorthorn breed. He presents true dual purpose characteristics both in his genotype and phenotype. Hilldale Commander was bred by W. T. Bennett who owned the Hilldale herd of Connell, Washington. He was never defeated in a show—as a 2 year old he capped his show career by being named Grand Champion bull at the the P. I. show (Pacific International) in 1959. One of his sons (Hilldale Commander’s Hero) was Grand Champion National Polled Shorthorn in 1965. Cattle out of him were top gainers and good carcass cattle. He sired many champions at major shows and consignment sales. His daughters were big cows that made tremendous brood cows—smoothly muscled, and great milkers with good clean udders. Hilldale Geronimo also came from the W. T. Bennett Hilldale herd at Connell, Washington. He is half brother to the Hilldale Commander bull as they both have the same sire. Structurally he is very similar to Hilldale Commander but overall perhaps slightly smaller. 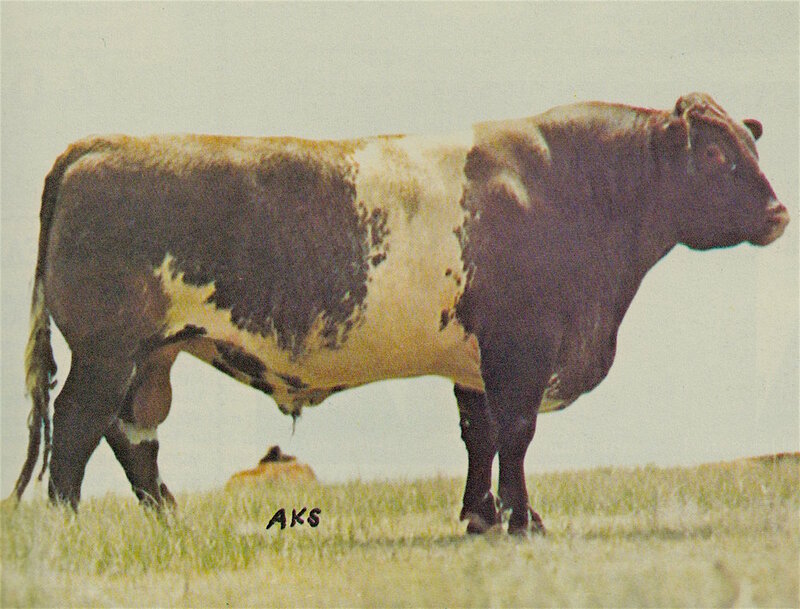 During his time he was used on more commercial cows than any other beef bull at All West Sires. 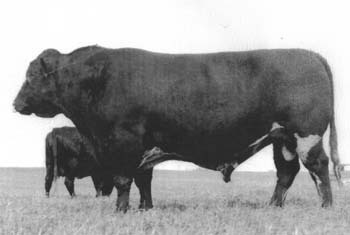 Lancer 457 was the National Champion bull in 1975. He had the size and scale breeders were looking for at that time. He was used extensively in the Millvale herd in Fordville, North Dakota. A search of Shorthorn pedigrees even today will show far his reach was within the Shorthorn breed. Hub’s Director was the epitome of a true dual purpose bull. His dam (HKKA Fantastic) was literally a fantastic cow who was productive through her 16th year with 11 registered offspring. Hub’s Director was used extensively in many Shorthorn breeding programs in the USA and Canada. He had excellent smooth natural muscling that was transmitted to his sons and daughters. Dominator was used successfully in the HUb’s herd for several years. He was a medium size bull that had good muscle expression that passed through to his calves. His sire, the famous Hub’s Director, was was one of the most popular bulls of his time. The Fantasy cow line incorporated the best of Hub’s breeding.